The WEN 5622 (22 ton) is one of the many heavy-duty log splitters covered in this article. If you need raw splitting power then you’ll be happy with our choices as we focus on heavy-duty gas log splitters, engineered to split large logs — hardwood and softwood. The focus of this article is to explore the best 22 to 30-ton log splitters, but in truth, this article is so much more than that. We explain everything you need to know about buying a log splitter. We discuss all of the different types of log splitters available, how to decide which size you need, vertical vs horizontal splitters — and not to mention our recommendations for the best heavy-duty, 22 to 30-ton log splitter models. Take my word for it, there’s a lot to learn before investing your money in a log splitter. We truly hope that this article will help you choose the best log splitter for the money. Where splitting wood began — with chiseled rocks. Learn more. For the greatest part of our existence, as in for millions of years, we have dedicated almost exclusively to hunting, gathering, depleting, and relocating — the nomad lifestyle. However, about 12,000 years ago and at the very dawn of the Neolithic Age, a critical tipping point occurred. We learned a new craft which would forever enhance our continuation as a species, a game-changing improvement which allowed us to adapt to rougher environments and build larger and safer settlements. We gave up on mere survival and embraced evolution, all thanks to the development of the first set of tools capable of woodworking. Since we have been harnessing fire for hundreds of thousands of years, we could now combine that trick with our newest woodworking skill. No more scavenging, cave-looking, or aimless wandering. The Neolithic man was arguably the first lumberjack in history. He enabled our entire agricultural expansion to grow alongside our freshly acquired carpentry trade. With the rise of farming societies, we were able to settle for a healthier and longer posterity and to protect our own with sturdy wooden structures against those long, cold winters which were to come during the latest part of our most recent Ice Age. From that moment on, humanity has embarked a non-stop evolutionary process — not by walking small steps, but by taking huge frog leaps. We went from simple farming lands to a globalized civilization in such a short time-span. However, we are still, fundamentally, driven by those very same motives as our Neolithic ancestors. Whether for land expansions, structural buildings, repairs, or protection against the elements, we rely massively on taming the environment for our entire social development. We are lucky, though, because nowadays we have several high-end, technological devices serving as alternatives to the once beloved wood ax— granted, it still looks pretty manly, but we can all agree that swinging an ax back and forth is both tiresome and ineffective. Instead, in this buying guide, we will be focusing exclusively on heavy-duty log splitters — their most common applications, size categories, types, safety tips, and regulations. Additionally, we will talk about the different firewood types, compare a typical log splitter with a lumberjack and, of course, no self-respecting guide would be complete without a comprehensive technical overview of several products available for you in the marketplace. Cast-iron splitting wedge and a 15-second cycle time will quickly and efficiently turn logs into firewood. This is the biggest log splitter we cover in this article. If you need speed and power (277 cc) then this is a good choice. We tried to include something for everyone as we know needs vary from person to person. Only you can decide which model is best for you but we do our best to give you options that are worth your money. At first sight, this topic might seem somewhat obvious, after all, the name says it all – a log splitter splits logs. However, there is so much more to consider. So, before we dive into a more detailed categorization, it’s important to understand under which circumstances these machines will perform best. Log splitters usually range from compact 4-tons models to heavy-duty 45-tons devices, but a larger tonnage will not always determine a better performance for the task at hand – more about this on the next segment. Ideal for both homeowners and landscaping professionals alike, you can use these machines for countless applications. For example, you can stock your firewood storage up before winter comes, as seasoned logs will always burn much longer than fresh ones. Make quick work of irregular terrains covered with withered trees for land expansion projects and reduce the total volume of disposable rubble when clearing these woodlands and groves. Turn your logs into firewood. But wait, there’s more. Log splitters are not one-trick ponies for the winter — whenever you’re not using them, you can always place them for rental, a booming business opportunity in the woodworking industry. In the United States, you can rent any machine ranging from 22-tons to 30-tons, since they can deal with all non-industrial projects, completely hassle-free. Which Log-Splitter Size (Tonnage Rating) Do I Need? Just like we said earlier, you won’t always require more power for your particular needs — same as all other machines you need to evaluate your demands, calculate the amount of effort they will take, and then select the most optimal size for your on-going projects. First things first, though. Contrary to popular belief, log splitters do not cut wood – like you would if you were using an ax with rapid swinging movements. Instead, they gradually split the log in half by applying force through a wedge powered by a hydraulic pump, which acts very much like a battering ram against the wooden surface. The value of this applied force needs to be greater than the natural log resistance, which is given by the Janka Hardness Test. This test measures the force you would need to embed a small steel ball (measuring 0,444 inches in diameter) to the size of its radius (0,222 inches) into a wooden sample of roughly one inch of thickness. For example, a white ash plank requires 1,320 lbf (pounds of force), the white oak needs 1,360 lbf, a sample of hard maple stands at 1,450 lbf, and one of the toughest exemplars, ebony, demands an impressive 3,220 lbf. You might wonder how any of this is relevant for an accurate log splitter sizing, which is why it’s time for some applied math. Say you want to work with a small sample of white ash logs, and now you know that this kind of wood scores 1,320 lbf at the Janka Hardness Test. A quick measurement of their average diameter gives you a range from 12 to 18 inches, and they are all cut at 24 inches in length. Now, the Janka Test calculates the force required to embed a small steel ball into a wooden plank at half its diameter. Following that same train of thought, we must determine how much force a splitter will need to ram its wedge completely through the log by using its hydraulic pump. For the sake of simplicity, let’s break down some basic concepts before we do our final calculations. We will consider the tonnage rating as expressed in short tons, meaning one ton will equal 2,000 pounds. The log length is not all that relevant, just make sure the length of the hydraulic pump is equal to or larger than this value. The total splitting force is expressed in short tons and is equal to the applied pressure times the area of the hydraulic pump cylinder (F=p*A). Log splitters are nothing like lumberjack axes since they do not rely on rapid acceleration and impact, but rather, on continuously applied pressure over a surface area. The manufacturer’s tonnage rating will not determine if a log splitter can or cannot split any given log, but it does determine how easily and how quickly it can do it. For optimal results, cut the logs at a length equal to or shorter than that of the hydraulic pump cylinder. The size of the wedge combined with the diameter of the hydraulic pump cylinder, play a much more important role in log splitting than the sheer splitting force. Some firewood has a higher Janka Hardness Rating, which only means they are denser, heavier, and tougher to split but are still well within the working range of most splitters in the marketplace. The last thing we want is to overwhelm you with unnecessary info, which is why we want to present you our golden rule of thumb. For all hardwood logs with a Janka Hardness Rating higher than 900 lbf with a diameter larger than 12 inches, you choose a heavy-duty log splitter from 22-tons to 30-tons. Better safe than sorry, right? Now that we have learned how to size our next log splitter, it’s time to think about the power source it will require – we have corded-electric, gas-powered engines, and tractor-operated log splitters. All of them get the job done in roughly the same fashion, but there are some details to reflect upon which can turn a decent purchase into a great one. Most models are compatible with standard residential outlets at 120V, and depending on the amperage of the engine (usually 15A), they have an average running wattage of around 1.8kW/h – similar to a 12,000 BTU Central Air Conditioner Unit, and slightly less than an electric stove. 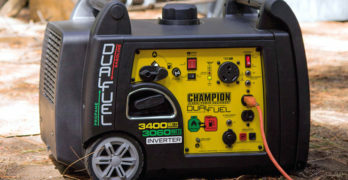 Same as all other home appliances, electric models are quieter than gas-powered ones, and since they don’t release any carbon byproducts, you can use them both outdoors and indoors — something gas-powered engines can’t offer you. Also, depending on their size and weight, they can easily be moved around either by placing it on the back of your pickup truck or by towing them. Corded-electric log splitters are not without their limitations. The longest extension cord available stands at 100-feet, so you can’t stray too far from an electric outlet. Electric models are more popular in compact sizes, ranging from 4-tons to 12-tons, with only a handful of them in the heavy-duty category – the largest one to date has a 22-ton splitting force rating. Finally, if you choose to buy an electric splitter, make sure you can plug it into any conventional outlet with parameters of 120V and 15A. Some professional-grade, heavy-duty, corded-electric log splitters might require a specialized outlet capable of handling 240V and 25A – also, you will most definitely need an additional circuit breaker for this purpose. Boasting the very definition of heavy-duty log splitters, not even the toughest of hardwoods are a match against these gas-powered engines. They make use of an internal combustion motor fueled with gasoline to generate enough mechanical force to operate the hydraulic pump responsible for driving the wedge through the log. Gas-powered splitters are also the most versatile — you can find countless models from the compact-sized 8-tons to the massive 60-tons beasts. Additionally, these machines have, arguably, the fastest cycle times among all builds — more about cycle times a little further down. They present two minor downsides, though. First, even though most models are EPA/CARB compliant, they still display a significant carbon fingerprint – so under no circumstances, you can use them indoors. Secondly, they are louder than electric splitters, which is why all manufacturers will require you to wear hearing protection equipment — as indicated by OSHA (The United States Occupational Safety and Health Association) for all machines louder than 85dB. However, it’s important to note that precisely because these splitters are so versatile, we need to find a proper balance between their strengths — them being high power and high speed. Choosing the most optimal gas-powered log splitter for your needs requires that you answer a few questions first. Do you need it for personal or commercial use? How often are you going to be using it? For each of those times, for how long are you going to be working with it? What is the average log diameter you are going to be splitting? Do you plan to use it by yourself or will you mostly have assistance? Choose power (higher tonnage rating) for personal use if you don’t plan on moving the splitter around and you expect to split heavier logs with diameters greater than 18 inches in a regular fashion, regardless of how often you are going to be using it throughout the year. Also, go for power if you intend to use it mostly by yourself. Since cycle times tend to be longer, you can set an easy-going working pace with just enough time to catch your breath in between logs. Go for speed (faster cycle times) for personal use as well, only in this case scenario, you are counting on a helping hand to be assisting you. Splitters with faster cycle times usually have a lower sheer power force, ideal for working long shifts splitting logs with an average diameter of fewer than 18 inches. Remember that fast cycles mean that each splitting gets done more rapidly, so unless you are training for the next Iron Man, call a buddy to help you out. Power or speed? Why not both? While you can most definitely get the best of both worlds, it doesn’t mean you have to. Take your time to ponder about your specific needs based on the info we just gave you. However, if you’re dead set on buying the best of the best, feel free to do so — just remember that the most elite log splitters are also the most expensive. We recommend them for commercial use and woodworking professionals, so try to estimate your ROI (return on investment) to see if it’s worth the hassle. 10.5HP, 306cc : Absolutely, one of the best 30-ton log splitters on the market. Very well made, great price, powered by a Briggs and Stratton engine. Built to perform in the harshest environments. Dual Log Cradles : Catch splitting wood with a pair of log cradles (included) — 2-positions, with option for mountable log table (sold separately). U-Beam Design : Patent pending U-Beam structural design is significantly stronger than typical I-Beam design. Learn more about YardMax Log splitters in our comprehensive buying guide. Last, but not least, let’s talk about the lesser known (yet by no means less efficient) tractor-powered log splitters. These machines depend on either your tractor’s hydraulic system (three-point method) or, if your tractor does not feature modern hydraulics, you can choose the PTO system, which relies on its power take-off. Both of them get the job done, but here are some minor considerations you need to make before choosing one over the other. Three-point log splitters are arguably the most popular choice. They have no internal hydraulic pump because they are plugged in directly to your tractor by one of its auxiliaries. This way, they leverage the tractor’s hydraulics to supply the required force to split the logs. The machine’s total splitting force, applied pressure, and average cycling time all depend directly on your tractor’s volumetric flow rating, measured in GPM (gallons per minute). Since you’ll be operating the tractor and the splitter by yourself, aim at lower cycle times to have enough time to gather the logs for splitting. Power take-off splitters have their very own hydraulic pumps — for those cases where your tractor is not equipped with one or is too small to provide the required power. This hydraulic pump is attached to the tractor’s power take-off shaft, hence the name. PTO splitters have the same functioning mechanism as all splitters — they apply pressure perpendicular to the log through a hydraulically-powered wedge to split it in half. Whether you choose a three-point or a power take-off splitter attachment for your tractor, you will have the same results. They are ideal for farmers with medium-to-large land extensions who require an efficient way to clearing small woodlands and groves for either firewood stocking for the winter, log trading with local lumber mills, or agricultural expansions. Horizontal vs Vertical Log Splitter? Many heavy-duty log splitters can be used vertically or horizontally. The splitter positioning doesn’t alter its overall performance, so this is more a matter of personal style combined with comfort and practicality. Go with a horizontal splitter if you expect you will be working mostly on even terrains with small to medium sized logs – some of these splitters even have a mechanical lift so that you won’t have to place log after log onto the splitting platform. You lay the logs on their sides, so you don’t need to worry about balancing them first – as easy as placing, securing, splitting, and repeating. Vertical splitters allow you to work on irregular terrains in a much safer way than horizontal ones. Since the wedge has a downward movement perpendicular to the ground, you can split massive logs which you wouldn’t be able to otherwise. However, since the logs will be standing up rather than laying on their sides, you need to balance them first before splitting them. Fortunately, you don’t have to settle for one or the other. Most commercial, heavy-duty, gas-powered log splitters feature a lever to switch from horizontal to vertical and vice-versa. Split small to medium sized logs in the horizontal position, and switch to vertical for those occasional massive logs, in just a few seconds. Either way, rest assured that the overall splitting force will not be affected by this position shift. An Axe vs A Log Splitter? A Little Friendly Competition — An Average, Heavy-Duty, Gas-Powered Log Splitter VERSUS The Lumberjack World Championship Men’s Record Holder. So, you are still pondering about the countless benefits a log splitter can deliver as the next addition to your toolkit. That’s quite alright, after all, there are few crafts in life regarded as manly as lumberjacking. Just look at James Howlett, the living embodiment of manliness, he’s been an avid lumberjack for most of his life. Fiskars X25 on the left. Powerhorse M1175D splitting wedge detail. You might recognize him by his alias, Logan, but most people know him as Wolverine — which brings us to our next topic. Have you ever imagined how the strongest lumberjack in the world would fare against an average, heavy-duty, log splitter? Well, we have, and since we do love our math, we decided to run a little simulation. Sadly, though, we couldn’t get a hold of Logan. But instead, we have his closest living contender. Fighting out of the Red Corner, The Lumberjack World Championship Men’s Record Holder and New Zealand’s pride, Jason Wynyard. In 2006, by using a five-pound ax, Jason split a horizontal aspen log measuring 12 inches in diameter and 28 inches in length in 15.94 seconds — which would go on to be the men’s world record, still unbeaten up to date. Fighting out of the Blue Corner, with 22-tons of sheer splitting force, a volumetric flow rate of 13 GPM, and a hydraulic pump measuring 4 inches in diameter, 24 inches in stroke, and 2 inches in the cylinder rod, the Dirty Hand Tools 100171 Gas-Powered Log Splitter. At an average applied pressure of 3,500 psi, this machine can split the same aspen log, in roughly 6.0 seconds — almost three times as fast. Even if we consider the total cycle time, which is the time it takes for the wedge to split the log completely AND to come back to its original position, it would only take 10.9 seconds to do so. Remarkable! That’s the only way to describe it. Not even the greatest lumberjack in human history can beat the efficiency and sheer force delivered by an average 22-ton log splitter. On top of that, Jason applied an absurd amount of energy as fast as he possibly could, for just one log. Which is why we want to take it down a notch and compare this very same log splitter with an average, able-bodied, young male, while doing the same task — splitting an average cord to completion. Each cord has 128 cubic feet in volume, or 64 logs measuring one foot in diameter and two feet in length. A log splitter is a tool that’s worth the cost if you split a lot of wood. Under the best circumstances, the lumberjack would take roughly two hours to split the entire cord, including transportation, and storage — an average of 112.5 seconds for each log. The splitter has a total cycle time of 10.9 seconds, so let’s double that time and round it up at 22.5 seconds, for the sake of simplicity and the benefit of the doubt. Considering how long it would take you to toss the logs on the back of your truck, store them, and grab a few refreshments along the way, we believe that’s a fair assumption. Even with a bit of relaxing time, using a splitter is five times faster than splitting logs with an axe — not to mention that the energy required to operate a splitter just cannot compare to the lumberjack’s effort. Log splitters will help you save both time and money, and of course, the priceless value of your overall health. Types, Hard-Data, Truths, And Common Misconceptions. Not all wood is created equal. There’s a lot of variability in firewood. We’re almost there, but before we dive into the many product reviews we prepared for you, we believe there is one critical piece of information left. Just as important as knowing which log splitter to buy, is knowing as much as possible about firewood, and busting some myths while doing so. Firewood is usually classified as either softwood or hardwood, given by the Janka Hardness Test. They also have a standard unit of measurement for the amount of heat energy they can release when burned – expressed in BTU (British Thermal Units). While it’s true that most types of firewood have roughly the same BTU rating, it’s important to understand that this production of heat does not depend on volume. Fact #1 states it depends on density, which is how “heavy” they seem to be. An average cord of dried aspen weighs approximately 2,100 pounds, while an average dried white oak cord registers an impressive 4,200 pounds — the same volume but twice as dense. Aspen wood releases about 18 million BTUs per cord, but white oak burns at almost 30 million BTUs. High-density woods will always burn longer than low-density ones. Our Fact #2 is about moisture level, which also brings us to our Myth-Busting #1 — freshly cut trees burn better. No, they don’t, and they can’t. Green logs will most definitely have a higher moisture level than seasoned ones. Combustion is very inefficient because it burns at low temperatures while releasing large amounts of smoke and creosote — a highly flammable carbon byproduct that accumulates inside chimneys and represents a serious safety hazard. Measure moisture levels in wood & soft building materials. Finally, we have Myth-Busting #2 — hardwood burns better than softwood. Not true, and “better” is relative. Instead, aim at measurements of fire longevity and temperature. The oak family along with eucalyptus, dogwood, walnut, and other hardwoods deliver a milder, more balanced, and more sustained fire which lasts longer – ideal for indoor chimneys. On the other hand, softwoods such as cedar, pine, and fir offer a brighter, crisper, hotter, and less durable fire. You can make them your go-to choice for your next camping trip and other outdoor activities. Learn more about firewood by reading our in-depth article : How Much is A Cord of Wood and more Firewood Facts. Now, let’s move on to the reviews of the best 22-ton To 30-ton log splitters. Impressive technology. Plug it into your wall outlet or generator. 120V Electric. 22 Ton Horizontal & Vertical Splitting Positions. Ideal for all wood species. Direct drive reduces the number of moving parts. 2.5 gallon poly hydraulic tank is rust resistant and protected from potential damage. Log Cradles aid in securing logs during splitting. ✓ View or download the MANUAL for the Swisher LS22E Timber Brute Eco Split electric wood splitter. Read the manual before using any log splitter. Because it’s electric, you can use it indoors safely. This corded-electric log splitter is the only model we will overview in the category, and rightfully so. This machine can deliver a maximum nominal splitting force of 22-tons/44,000 lbs., powered by its 2hp, 15A, 120V motor manufactured by North American Electric, Inc. – this splitter is an All-American powerhouse. Quick side note before we advance, we recommend you use it with a 20A circuit breaker, for optimal, and safer, working results. The hydraulics in this splitter feature a fluid tank with a 2.5-gallon capacity, along with a two-stage pump which delivers up to 11 GPM of volumetric flow rate. The pump cylinder measures four inches in diameter and 25 inches in length, which equals to a 12.56 square inches contact area and roughly 3,500 psi of applied pressure. Close-up views of various parts of the Swisher LS22E. This splitter is also versatile since you can operate it both in the horizontal and vertical positions. The 7-inch wedge is resharpenable with an average cycle time from start to finish of fewer than 13.0 seconds. At a modest 460 lbs. of weight, the LS22E is also road-towable. Couple it with the U.S. Wire & Cable 65100 featuring a 12-gauge, 15A, 3-wire, double-insulated, SJTW-rated, OSHA-compliant, 100-feet extension cord, and you’ll be good to go. Be sure to ask for your standard three-year warranty. Efficiently turn logs into firewood. Split logs up to 14 inches in diameter and 25 inches in length in under 14 seconds. Four hours of run-time (half-load) on one gallon of gasoline. Towable frame with 2-inch ball hitch allows for transportation up to 45 miles per hour. 10 GPM two-stage pump. 4 x 24 inch hydraulic cylinder. As we enter the gas-powered builds, we’ll begin by reviewing the WEN 56222 Lumberjack. This product offers a maximum splitting force of 22-tons/44,000 lbs., thanks to its 210cc, four-stroke, overhead valve, single cylinder, air-cooled, EPA/CARB-compliant, gasoline-powered engine. It features a one-gallon fuel tank and a separate 11.45-fluid-ounces oil reservoir. You can expect an average running time of four hours at half-load capacity and a relatively quiet noise rating of 63dB at 22-feet – just slightly louder than a normal conversation. Versatile — can be used horizontally or vertically. The hydraulic system presents a 6.5-gallon fluid tank with a cylinder of 4″ in diameter and 25″ in stroke. With a contact area of 12.56 square inches, you will have an average applied pressure of 3,000 psi with a maximum of 3,500 psi. This splitter comes with a two-stage, 10 GPM volumetric flow rate. Weighing only 590 lbs., feel free to tow the WEN 56222 Lumberjack up to 45mph. WEN has a set of recommendations to enhance the splitter lifespan. Use 87-octane gasoline only and 10wt AW32 oil. When splitting logs, make sure their diameters and lengths are no longer than 14 inches and 25 inches, respectively, to make the most out of its 7-inch steel wedge – this product features both horizontal and vertical operation modes, an average cycle time of 14.0 seconds, and a standard two-year warranty. Also available as a 30 ton log splitter, which we cover later in this article : WEN 56230 Lumberjack. Comes with a 2 year limited warranty with FREE lifetime technical support. This 25-ton log splitter has a 12 second cycle time, and solid integrated log cradle and log catchers. The 100251 accommodate logs up to 23.8 inch long and no heavier 100 pounds. It’s built on a towable frame with an integrated 2″ ball hitch coupler and DOT approved wheels to make it easy for towing. Let’s take it up a notch with the Champion Power Equipment 100251. Equipped with a 224cc, four-stroke, overhead valve, recoil-starting engine, this splitter can deliver up to a maximum of 25-tons/50,000 lbs of sheer splitting force. Its fuel tank capacity is 0.9 gallons with a separate 19.2-fluid-ounces oil reservoir. The hydraulics in this splitter come with a 4.0-gallon fluid tank capacity, along with a two-stage pump which delivers up to 11 GPM of volumetric flow rate. The pump cylinder measures four inches in diameter and 22.6 inches in length, which equals to a 12.56 square inches contact area and roughly 3,500 psi of average applied pressure with a nominal maximum of 3,980 psi. At only 480 lbs., the CPE 100251 is towable to 45mph. CPE has a few pieces of advice to share with you. While the CPE 100251 is built to endure the toughest of environments, make sure you match the hydraulic fluid and the engine oil accordingly – quick side note, as long as you use 85-octane (or higher), unleaded gas, your splitter will run just fine. If the outdoor temperature is greater than forty degrees Fahrenheit, use the AW-32 hydraulic fluid and the 10W-30 engine oil. However, for extreme cold conditions, change to the Dexron-III and the 5W-30, respectively. You can handle this splitter in both horizontal and vertical modes, at cycle times of about 12.0 seconds. Also, don’t forget about your two-year warranty. Integrated Log Cradle. Included: log catcher, single wedge. Wheels: 16″ (40.6 cm) Pneumatic, DOT Approved. ✓ When you order this, or any of the other log splitters they will arrive via a crate. If you’re not used to ordering large items online, don’t worry. They are packaged properly in crates to avoid damage. It’s not any different than ordering a TV or a chainsaw. The only difference is that someone will have to sign for the log splitter when it’s delivered. 25-ton force can split a 26″ log every 17 seconds. Can split both softwood and hardwood. Horizontal & Vertical Splitting: Roll larger logs under wedge to minimize heavy lifting. Full Beam Design with Locking Pins ensures less vibration and noise. 208cc LCT 4-Cycle OHV Engine w/ Recoil Start. 8.5 ft-lbs of torque. Efficient internal oil delivery system provides additional lubrication ensure parts are properly lubricated. 8″ Heat-Treated Steel Splitting Wedge. This splitter offers a maximum splitting force of 25-tons/50,000 lbs., thanks to its 208cc, four-stroke, overhead valve, gasoline-powered engine. It features a 0.7-gallon fuel tank and a separate 16-fluid-ounces oil reservoir. The SLS20825 25-ton log splitter features a 6.5-gallon hydraulic fluid tank combined with a 4.13-inches in diameter, 24.5-inches in stroke cylinder. The pump has a contact area of 13.39 square inches – which produces an average applied pressure of 3,000 psi with a maximum of 3,700 psi. This splitter comes with a two-stage, 11 GPM volumetric flow rate. Weighing only 440 lbs., feel free to tow the SLS20825 up to 45mph. Southland has a set of recommendations to enhance the splitter lifespan. Use 87-octane, unleaded gasoline only and 10W-30 engine oil. When splitting logs, make sure their diameters and lengths are no longer than 30 inches and 26 inches, respectively. This product features both horizontal and vertical operation modes, an 8-inch steel wedge with an average cycle time of 16.0 seconds, and a standard 3-2-1 warranty (three years for the frame, two years for the engine, and one year for the hydraulic system). Made in the USA! Support US manufacturing. 190 cc / 8.75 Hp — Briggs & Stratton Engine. 28 Ton Horizontal & Vertical Splitting Positions provides ample splitting force. 2 Stage Pump optimizes cycle time. Direct drive means fewer moving parts. 2.5 Gallon Poly Hydraulic Tank. Rust resistant and protected. 1″ Machined Steel Compound Wedge. Road Towable. Easy to transport and move around. Vertical Beam has a lock for added security. Our second to last product review features the Swisher LSRB87528. This splitter offers a maximum force of 28-tons/56,000 lbs., thanks to its 190cc, 8.75hp, four-stroke, single cylinder, air-cooled, EPA/CARB-compliant, gasoline-powered engine manufactured by Briggs & Stratton. The hydraulic system presents a 2.5-gallon fluid tank with a cylinder of 4.5″ in diameter and 24″ in stroke. With a contact area of 15.90 square inches, you will have an average applied pressure of 3,000 psi with a maximum of 3,500 psi. This splitter comes with a two-stage, 11 GPM volumetric flow rate. Weighing just slightly over 400 lbs., feel free to tow the Swisher LSRB87528 up to 45mph. Swisher has a set of recommendations to enhance the splitter lifespan. When splitting logs, make sure their diameters and lengths are no longer than 24 inches for each case. This product features both horizontal and vertical operation modes, a 7-inch sharpenable wedge, an average cycle time of between 20.0 to 24.0 seconds, and a standard three-year warranty for all components – except for the hydraulic system, which has a one-year warranty. WEN has been making high-quality power equipment since 1951. 30 ton log splitter / 212cc engine and a 4.5 x 24 inch hydraulic cylinder. Get four hours of half-load run-time off of one gallon of gasoline. As we approach the final product review of our buying guide, we’ll discuss the massive WEN 56230 Lumberjack. This product offers a maximum splitting force of 30-tons/60,000 lbs., thanks to its 212cc, four-stroke, overhead valve, single cylinder, air-cooled, EPA/CARB-compliant, gasoline-powered engine. It features a one-gallon fuel tank and a separate 11.45-fluid-ounces oil reservoir. You can expect an average running time of four hours at half-load capacity and a relatively quiet noise rating of 63dB at 22-feet – just slightly louder than a normal conversation. Sounds familiar? That’s because both the WEN 56222 and the WEN 56230 feature the same engine, the difference lies in the hydraulics. The hydraulic system presents a 7.0-gallon fluid tank with a cylinder of 4.5″ in diameter and 24″ in stroke. With a contact area of 15.90 square inches, you will have an average applied pressure of 3,500 psi with a maximum of 3,750 psi. This splitter comes with a two-stage, 12 GPM volumetric flow rate. Weighing only 442 lbs., feel free to tow the WEN 56230 Lumberjack up to 45mph. Just as with the 56222 Lumberjack, WEN has a set of recommendations to enhance the splitter lifespan. Use 87-octane, unleaded gasoline only and 10wt AW32 oil. When splitting logs, make sure their diameters and lengths are no longer than 14 inches and 25 inches, respectively, to make the most out of its 7-inch steel wedge – this product features both horizontal and vertical operation modes, an average cycle time of 14.0 seconds, and a standard two-year warranty. You might wonder what the greatest differential is about this product, after all, it’s almost a 56222 with virtually the same specs, and the answer is simple. The WEN 56230 Lumberjack can split logs of hardwood which the 56222 would not be able to handle. Remember way back up when we talked about sizing? Here we have factual evidence that the tonnage rating, while important, is not the most decisive factor when considering your next log splitter purchase. The WEN 56230 is one of the best 30 ton log splitters for your money that will effectively split almost anything you throw at it. Excellent Value. Capable of splitting logs 36″ in diameter and 25″ long. 27 ton gas log splitter with 196cc, 6.5 hp Kohler Engine. 3400 PSi. 4.5″ cylinder with 24″ stroke. Splitter weight: 605 lbs. (ships in a crate). Shipping weight: 644 lbs. This machine can deliver a maximum splitting force of 27-tons/54,000 lbs., powered by its 6.5hp, 196cc, four-stroke, EPA/CARB-compliant, SH265 motor manufactured by Kohler Company. The hydraulics in this splitter feature a fluid tank with a 6.5-gallon capacity, along with a two-stage pump which delivers up to 13 GPM of volumetric flow rate. The pump cylinder measures 4.5-inches in diameter and 24-inches in length, which equals to a 15.90 square inches contact area and a maximum of 3,400 psi of applied pressure — average pressure is about 3,000 psi. This splitter is also versatile since you can operate it both in the horizontal and vertical positions. The 8-inch wedge can be resharpened with an average cycle time from start to finish of fewer than 14.0 seconds. At only 590 lbs. of weight, the DHT 100408 is also road-towable at 45mph. Dirty Hands Tools offers a standard three-year warranty. Major features of the 100408 log splitter.